Flavor Burst has revolutionized the soft serve industry with its one-step process for blending flavored syrups with soft serve. Flavor burst soft serve machines incorporate a unique and advanced patented technology that literally stripes the colorful flavoring on the inside and outside of the soft serve without causing it to run off the cone. 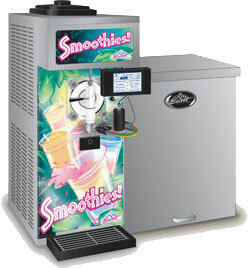 Flavor Burst also offers machines that flavor frozen drinks like shakes, smoothies, frozen coffee and frozen cocktails. Flavor Burst delivers a portion controlled injection of flavorings that allow the operator to blend multiple ingredients in the same serving, creating a multitude of flavor possibilities. Since its inception in 1992, Flavor Burst has expanded its operations to more than 40 countries worldwide. Lane and McClain is proud to be the exclusive distributor for Flavor Burst equipment in the region. The Flavor Burst system is a revolutionary system that allows you to add a variety of flavors to your soft-serve or yogurt freezer by injecting concentrated flavorings throughout your finished product. The result is a fun, colorful product filled with great-tasting premium flavor! 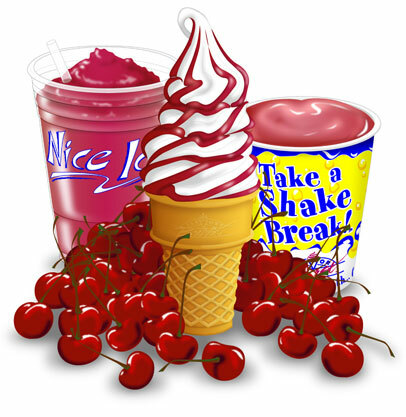 Attract kids and adults alike with a variety of delicious tastes – Chocolate Swirl, Strawberry, Butter Pecan, Bubble Gum, Blue Goo, Green Apple – nearly 40 flavors in all! 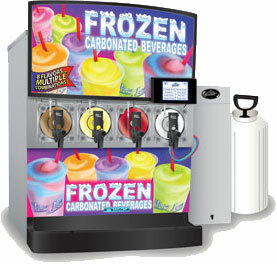 Take frozen carbonated beverage programs (FCB) to a whole new level with Flavor Burst frozen beverage systems! Enjoy a variety of premium flavors, or combine flavors for even greater variety. Let Flavor Burst be your formula for success! Shown with Taylor C302 and TS 80FCB ? Flavor Burst is the ideal companion for your frozen uncarbonated freezer! 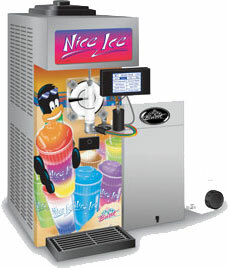 Flavor Burst frozen beverage products are proven sales builders for frozen cocktails, slush drinks, frozen coffee and more! Shown with Taylor C428 and TS 40BEV-JR 4-flavor mini cabinet? Serve 8 or more flavors from a single smoothie mix–with no additional blending. Reduce labor and increase profit! The only one-step process to blend candy and confections into soft serve!CrunchiCreme gently blends ingredients into soft serve or milkshakes as they are dispensed into either a cup or cone with ease.